We want to spend the final days of 2010 appreciating those who have supported us this year. Three years ago, we could have never hoped for this much success. Our only goal was to search, dig and find the most topical Bigfoot news, and share it with anybody that listen. If we were lucky, we would make a modest contribution to the Bigfoot Community and find an audience. We have been more than lucky, thank you. We will save the last day for our fans, without your tips comments and suggestions we wouldn't have the mass appeal we have. For now, we would like to recognize the Local News. Below are some of the best clips from 2010. We will save the last day for our fans, without your tips comments and suggestions we wouldn't have the mass appeal we have. For now, we would like to recognize the skeptics. One of our favorites Brian Dunning. Brian bruised us pretty bad in his post at the SkepticBlog.org and maybe we threw the first punch. 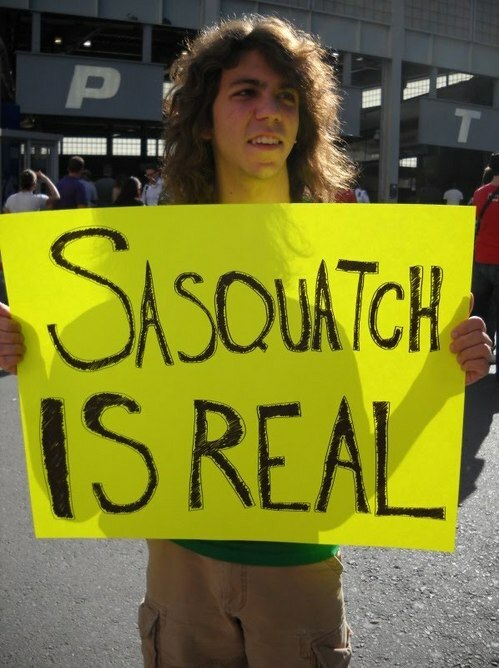 The truth is, we think that even-handed skeptics are a healthy part of the Bigfoot conversation. We have said as much last year when we presented Benjamin Radford's Top 10 Reason's Bigfoot is Bunk. 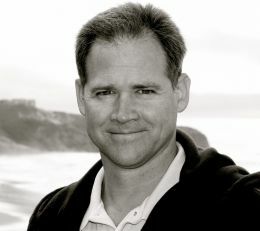 A self described Bigfoot hopeful (he explains this further by claiming the hope is based more on emotion than on any actual likelihood), Brian Dunning has made a great case against both sides of the Bigfoot debate at his site skeptoid.com Thank you Mr.Dunning for keeping us on our toes and for being an even-handed skeptic. Is anyone doing any justice to the Bigfoot claim? Today, we're going down a dark forest path on the trail of Gigantopithecus Americanus: the North American Sasquatch. I see many cases on both sides of the Bigfoot debate where bad arguments, bad science, and just plain weirdness is being put forth, doing great disservice to their own side of the argument. There are intelligent and productive ways to explore a subject and present a case, but I don't see it being done very often on either side of the Bigfoot debate. I'm going to present what I consider the top three ways that each side of the Bigfoot claim is shooting themselves in the foot, beginning with the skeptics. 1. Saying that the guy who confessed to making tracks disproves the entire thing. In 2002, a Washington logger named Ray Wallace died, and his family produced the carved wooden feet that he used to make Bigfoot footprints all over the Pacific Northwest, beginning in 1958. The newspapers and TV tabloids lapped it up, reporting that the entire Bigfoot phenomenon was now proven to be a hoax perpetrated by Wallace. Well, I feel the time has come for me to come clean about something that I've wanted to get off my chest for decades. When I was a kid, I once made some fake Bigfoot footprints too. The cat's out of the bag. Bigfoot is now doubly proven to be a hoax. 2. Saying the Patterson-Gimlin film is "the worst fake ever." I'm not a Bigfoot believer but I will give credit where credit is due. The Patterson-Gimlin film looked like a real animal to me. The Discovery Channel's "duplication" of it looked ridiculous. It looked nothing like a real animal, and certainly didn't remotely resemble the subject shown in the Patterson-Gimlin film. Chewbacca looked more real than the Discovery Channel's Bigfoot suit. Hollywood's state of the art in gorilla suits in 1967 were Planet of the Apes and The Galileo Seven episode of Star Trek. Two loggers with no previous gorilla suit experience made a suit that was better than today's state of the art, and certainly light years ahead of the 1967 state of the art. I'm not saying the film's real, I'm saying give credit where credit is due, and admit that if it is a fake, it's astounding. If you disagree then go through a stabilized version frame-by-frame as I have. The half dozen or so Hollywood special effects artists who have since "come forward" to claim that they were responsible for the Patterson-Gimlin Bigfoot suit, and the dozens of guys who have "come forward" to claim that they were the guy wearing the suit, are no more evidence against the film than Ray Wallace's wooden feet are evidence that no real Bigfoot footprints exist. Critics of the film also say that the creature's behavior is unrealistic. I have no knowledge of what a real Bigfoot's behavior might be, but I have encountered bears half a dozen times, and they acted exactly like the Patterson-Gimlin creature: just walked away, unconcerned, with maybe only a look or two back. 3. Criticizing good scientists like Jeff Meldrum. I've read old and new criticism of Dr. Jeff Meldrum of Idaho State University, and I'm only mentioning his name in particular as one example. There are several prominent tenured professors at legitimate accredited universities who have done Bigfoot research. They are probably far, far outnumbered by professors who have done psychic or other paranormal research, but let's stick to the subject. Dr. Meldrum is not the obsessed Bigfoot guy who lives and breathes it 24 hours a day, and exhorts his students to become believers. 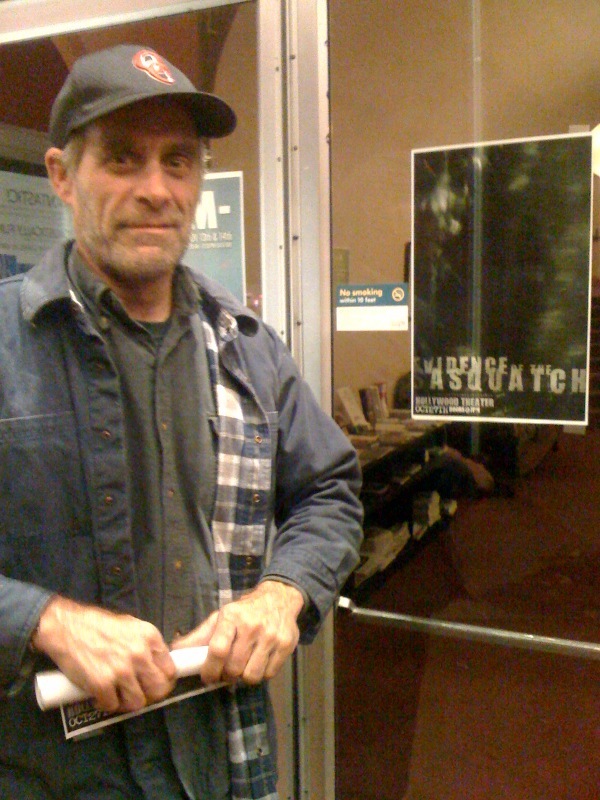 Rather, he has a long list of publications and edited volumes, none of which pertain to Bigfoot; he teaches six courses, none of which pertain to Bigfoot; he's an Associate Professor of Anatomy & Anthropology; he's an Adjunct Associate Professor in the Department of Anthropology and the Department of Occupational and Physical Therapy; and he's the Affiliate Curator at the Idaho Museum of Natural History. He's not the Professor of Bigfoot. He carries as great a load of academic work in non-Bigfoot related studies as any professor. He's a real scientist doing real work. On top of all of this, he studies casts of Bigfoot footprints. Dr. Meldrum is responsible for drumming up his own grant money from private donors to fund any Bigfoot research that he chooses to do. In some cases, he has received small amounts of matching funds from the university. If you feel this was a bad expenditure, then criticize the university regents who decided to write the check, don't criticize the person they gave the funds to. The work of responsible scientists like Dr. Meldrum is exactly what true skeptics should be asking the Bigfoot community for, not criticizing him for it. 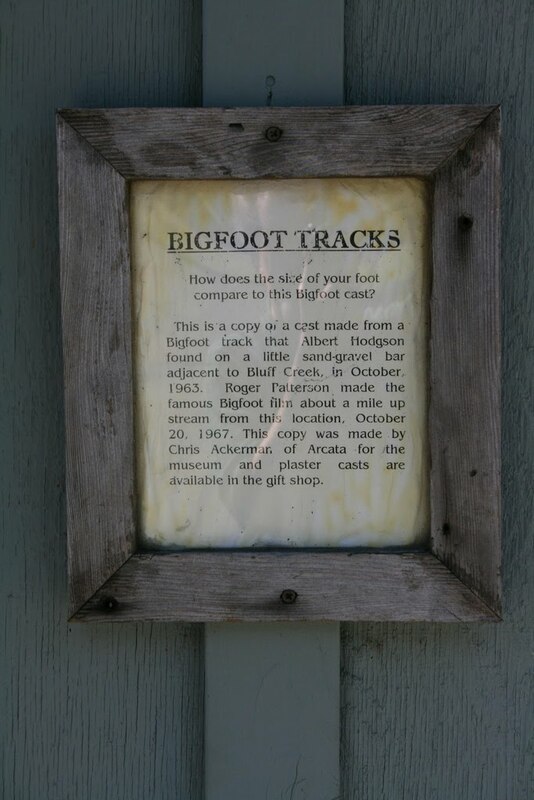 Here is the way for a responsible skeptic to handle the Bigfoot claim. It's to say "You're making an extraordinary claim. Show me extraordinary evidence, and I'll believe it. Until then, I'm not convinced." Occasionally candidate evidence has come forward, like hair and stool samples, or the skull cap from Tibet. This evidence has been properly tested, and so far no new great ape species has been proven (and if I'm wrong about that, I invite your comments on the web site). A responsible skeptic's obligations do not extend to poking fun at the people who are looking for evidence, considering the lack of evidence to be proof of no evidence, or making personal comments about people. That's not good science. In some cases, Dr. Meldrum, and other scientists like him, are being better skeptics than the skeptics. 1. Stating that Bigfoot is an extraterrestrial, or comes to us from another dimension. If Bigfoot claims are going to make any headway into mainstream science, it will be through zoological channels, not supernatural channels. Such claims are the most extreme form of counterproductivity, setting Bigfoot claims backwards all the way into the Dark Ages. 2. 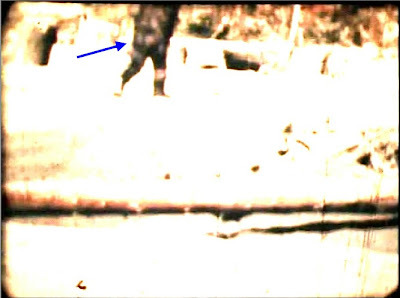 Being delusional: Seeing detailed Bigfoots in a blurry photograph that shows no such thing. Half the Bigfoot web sites out there show numerous photographs of bushes and wooded areas, with certain areas circled. There's nothing within the circled area except other bushes; maybe a shadow, or a dark branch. But wait! Here's a detailed sketch of what's hiding inside that shadow. I'm not a psychologist so I won't presume to affix a label to this phenomenon; but seeing things in pictures that aren't there, and then obsessing over it, does not strike me as healthy. 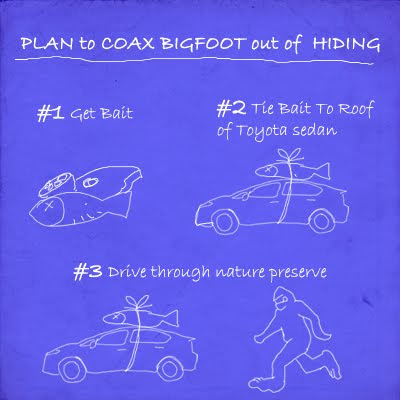 It's certainly more effective at raising concern for the claimant, than it is at convincing anyone that Bigfoot exists. If all you have is bad evidence, you're better off not presenting it. 3. Doing bad science: Seeking to support a preconceived conclusion. Science doesn't work by starting with the goal of proving something and then assembling whatever evidence you can find that supports it. That's doing propaganda, not science. Start with a testable hypothesis, and then form a theory based on the evidence revealed by the data. Of course, following this method is going to make it pretty hard to come up with a theory that's supportive of Bigfoot, but that's what it's going to take if Bigfoot supporters hope to prove their point. I know you're going to listen to all of this and conclude that I'm the pro-Bigfoot guy. I'll admit to being a Bigfoot hopeful (a hope based more on emotion than on any actual likelihood), but certainly not a believer. My point is simply that both sides of every debate contain a lot chaff along with the wheat. Both sides of every skeptical issue believe that they're right, but even those on the side that is right (and by that, I mean whichever side you're on) can probably stand to clean up their act a little, no matter what the issue is. Alderman ,Jesse Harlan. "Bigfoot studies render academic an outcast." MSNBC. MSNBC.COM, 3 Nov. 2006. Web. 5 Nov. 2009. Autumn Williams. 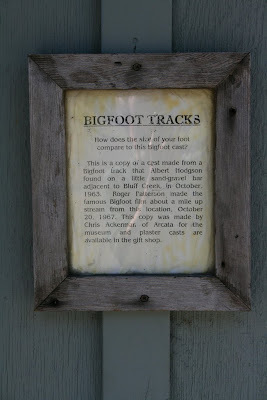 "Bigfoot Photo and Picture Gallery." 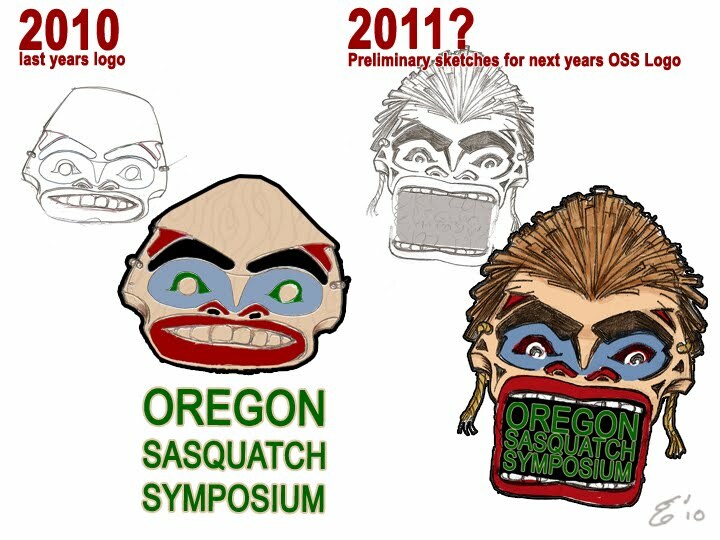 OregonBigfoot.com, The Legend Lives. Autumn Williams, 1 Jan. 2009. Web. 18 Nov. 2009. Daegling, David J., and Schmitt, Daniel O. "Bigfoot's Screen Test." The Skeptical Inquirer. 1 May 1999, Volume 23.3: 3. Davis, Marlon K. "M.K. Davis' frame by frame rendition of the Patterson Film." Bigfoot Encounters. Bobbie Short, 1 Dec. 2005. Web. 15 Nov. 2009. Eagan, Timothy. "Search for Bigfoot Outlives The Man Who Created Him." The New York Times. 3 Jan. 2003, New York Edition: Section A, page 1. Meldrum, Jeff. Sasquatch: Legend Meets Science. New York: Forge Books, 2006. Napier, John Russel. 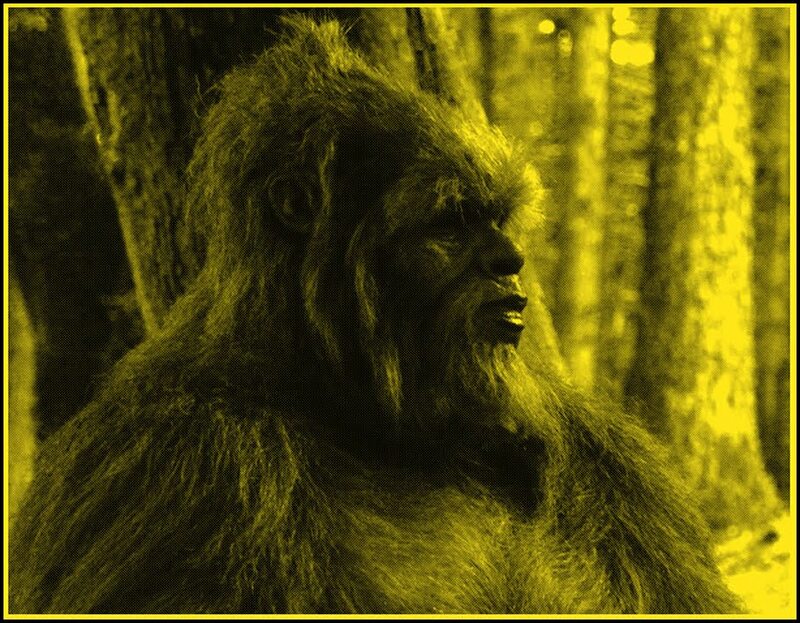 Bigfoot: The Sasquatch and Yeti in Myth and Reality. New York: E. P. Dutton, 1972. Dunning, Brian. "Killing Bigfoot with Bad Science." Skeptoid Podcast. Skeptoid Media, Inc., 3 Dec 2006. Web. 27 Dec 2010. We will save the last day for our fans, without your tips comments and suggestions we wouldn't have the mass appeal we have. For now, we would like to recognize our sister blogs; Whales in Space and Ghost Hunting Theories. You know as well as us there are Bigfooters who think he's extra terrestrial (think UFO's) and there are those who think he's paranormal (think ghosts). 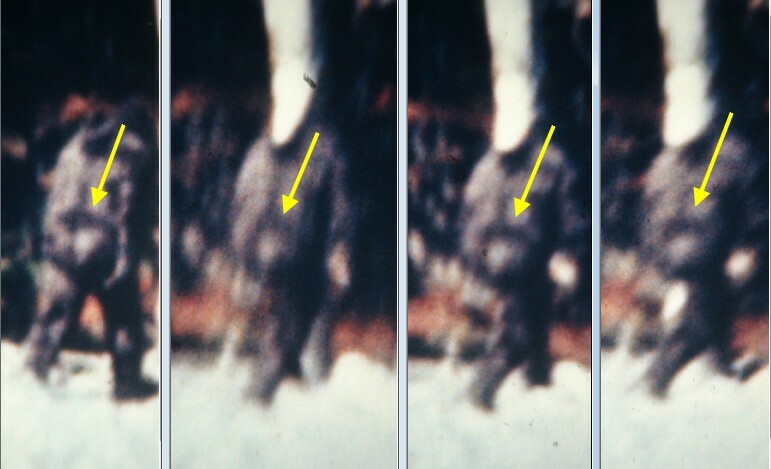 It is no surprise that those who cover UFO's and Ghosts may also be interested in Bigfoot. We have our hands full with Bigfoot, but we have had great support from two blogs that cover Bigfoot and beyond. Ghost Hunting Theories is a new friend this year and they don't just have ghost hunting theories, they also have a few good Bigfoot theories as well. It is ran by Autumnforest, a ghost hunter who grew up in a Civil War field hospital where many unexplainable occurrences changed the course of her life. Thank you both for your support this year and providing us with other things to think about. We want to spend the final days of 2010 appreciating those who have supported us this year. Three years ago, we could of never hoped for this much success. Our only goal was to search, dig and find the most topical Bigfoot news, and share it with anybody that listen. If we were lucky, we would make a modest contribution to the Bigfoot Community and find an audience. We have been more than lucky, thank you. We will save the last day for our fans, without your tips comments and suggestions we wouldn't have the mass appeal we have. 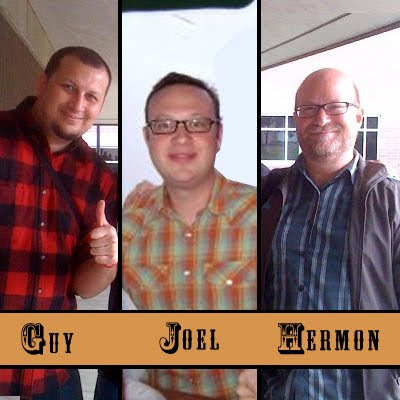 For now, we would like to recognize Guy, Joel and Hermon. Christmas day is special day for us At Bigfoot Lunch Club, It is the anniversary of our very first post. 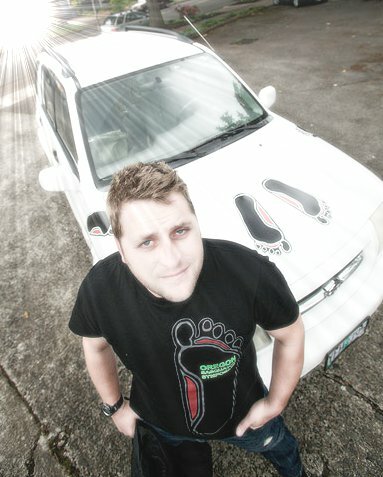 Joel has been on board since day one and deserves credit for being co-founder of the Bigfoot Lunch Club. He actually went to university for anthropology & religion and is a huge Steely Dan fan. Hermon, a professional writer with some serious journalistic skills, gave us some of our most popular posts this year. Bigfoot Lunch Club would like to thank both of these guys for their support and contributions to this blog! Bigfoot Sightings and Orchards Linked? We will save the last day for our fans, without your tips comments and suggestions we wouldn't have the mass appeal we have. For now, we would like to recognize Craig Woolheater. Craig is also responsible for Cryptomundo, you may have heard of this blog about Cryptozoology with a guy named Loren Coleman as one of the contributers. Cryptomundo was an early inspiration to us and the reason why we asked for Loren Coleman books for Christmas last year. Craig continues to say good things about us and credits us at Cryptomundo and on Facebook. Bigfoot Lunch Club would like to thank you for your support this summer and helping us jumpstart our Facebook page. Thank you Craig Woolheater. We are spending the last ten days of 2010 to celebrate our greatest supporters. We will save the last day for our fans, without your tips comments and suggestions we wouldn't have the mass appeal we have. For now, we would like to recognize Thom Powell. If you ever met Thom, you would quickly realize everything he says is so matter-of-fact. He can suggest ideas so calm and casual, it may not be until later that these ideas germinate and bloom (explode even) in your mind. Yeah, we said it, Thom will blow your mind! Thom's greatest gift is using distinctions to define concepts. In a few choice words he can relay an entire argument. "guerrillas, not gorillas," and "intel, not science" are poetic and illuminating. As the recipient of so many of Thom's novel ideas and unique perspectives, we were thrilled to find out he was starting his own Blog. Now he can share with the rest of the world, what he has shared with us. We would like to thank Thom Powell for supporting Bigfoot Lunch Club. Below is a teaser for his first three posts. Who hasn't entertained the idea of writing a book? But then, vitrually everyone talks themself out of it: It takes too long. No one cares. Who reads books anymore, anyway? We will save the last day for our fans, without your tips comments and suggestions we wouldn't have the mass appeal we have. For now, we would like to recognize Cliff Barackman. Hands down. 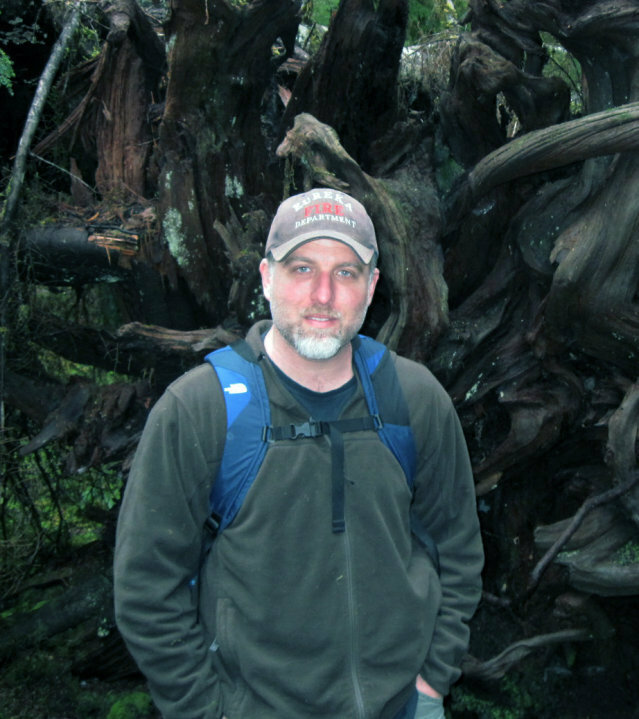 No one has taught us more about the 'Squatch then Cliff Barackman. His approach that there are no absolutes and multiple possibilities enables him to have an encyclopedic knowledge of Sasquatch theories at the tip of his tongue. In a single sitting he can share any trait attributed to Sasquatch and credit where the data came from. When your out in the field with him, its even better. Cliff has been a great supporter of Bigfoot Lunch Club and we would like to thank him by listing his most popular blog posts of all time. Thank you Cliff for making this one of the greatest years ever. We like it when "outsiders," standing on the precipice, respectfully peak into our Bigfoot community. The idea and notion one can fall in love with the pursuit and wonder of Sasquatch without jumping in with both feet is, to us, a beautiful thing. This is the case with David Doody's Utne Reader article. It is nice to have one of these high brow literary types view us from the precipice with respect and delight. I’ll admit it: I’m a sucker for a Bigfoot story. The idea that there is something that might be avoiding the long hand of scientific scrutiny makes my day. I smile when I hear of a new frog or monkey out there. But, it’s bitter sweet, as any new discovery reminds me that soon there really will be no place on this planet to hide. Frank Bures, writing for Minnesota Monthly, comes to the same conclusion in his article “The Search for Sasquatch.” Bures’ desire to believe in such a thing as a “9-foot-tall monkey” led him into the north woods of Minnesota, along with 41 other fellow Bigfoot explorers, to try to prove what no one else has proved before. But through the course of his adventures Bures realizes that proof of discovery would mean one less magical thing left out there, away from human touch. I felt a wave of sadness sweep over me at the thought. The reason I had always loved the idea of Bigfoot was that, if he was real, it meant the world still contained mysteries, things that were yet unknown and maybe even unknowable. It meant the woods were still big and dark enough to harbor something like Sasquatch. Bigfoot was like a hairy wood sprite loping through my dreams—the spirit of the wild! Find him and, well, he’d be just another monkey. Living close to nature, without thorough schooling, peasants have always been frightened of the mythical wild man. In the 18th century, the oppressed central European peasantry was gripped by a terror of aristocratic vampires in the run-up to the French Revolution. The hysteria raged for a generation. Thousands of sightings were reported. Villages swore by Christ they knew what they had seen. The Austro-Hungarian Empress Maria Theresa was concerned enough to dispatch her personal physician to investigate whether or not vampires existed. They were not real, but poverty, oppression, ignorance and superstition were. With political reform across the continent in the 19th century, the swarms of fairies, Woodwose, beasts and ghosts that had inhabited European minds for centuries slowly faded away. But in Romit, I touched a living myth. Judah begins his essay by telling us that “Dushanbe is not a real city. It isn’t a real capital and Tajikistan is not a real country.” That, in the end, is really what his story is about. He does not expect to find an ape-like creature towering over him in the mountains of Tajikistan. Rather, Judah is trying to figure out why people believe in things that are so clearly made up. In the end, these stories are doing different things—both great in their own way and both highly entertaining. As for me, I think I’ll continue to hope that there are new frogs and cats out there, as well as something that might have gotten stuck somewhere on the evolutionary path between monkeys and us. Image by Bob Doran, licensed under Creative Commons. Fan's we recently got word from the Anthony Bourdain channel, also known as the Travel Channel, asking us to help promote their new show. To be honest, we are already fans of Bizarre Foods with Andrew Zimmerman and Man v. Food with host Adam Richman, so adding another favorite to list is something we are happy to do. Below is the reprinted request from the Travel Channel the parenthesis are ours. "I work with Travel Channel and recently came across your site (in my bookmarks), the (internationally known) Bigfoot Lunch Club. 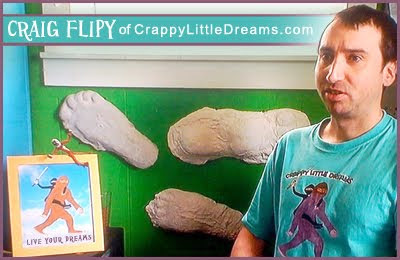 I thought it might be appropriate to reach out to you because (of your vast social network and) we are featuring Felton's Big Foot Discovery Museum on Travel Channel’s new series, Mysteries at the Museum, Tuesday night. In this show we take a look at the strange and curious remnants of America's past, often accompanied by scandal, mystery, and intrigue. The next episode, airing Tuesday, December 21st at 9 E/P, will feature some of the nation’s most revered museums, including the Big Foot Discovery Museum. Would you be interested in helping us spread the word about this show via your (successful) blog and (vast) social media network? If so, you will find additional information about each of the mysteries that will be uncovered in this volume below. I hope you enjoy the show! Theodore Roosevelt Birthplace, National Historic Site: Tucked away on the east side of Manhattan is Theodore Roosevelt’s childhood home. Inside are two particular artifacts on display that had a bigger impact on Roosevelt’s life than any other. Both of these artifacts share a strange feature, and saved the life of one of America’s greatest statesmen. Museum of Science and Industry: Inside Chicago’s Museum of Science and Industry, there’s a vehicle that resembles a space hip or rocket, but it’s neither. In the 1960’s this amazing automobile helped a young California hot rod driver do something no one had ever done before- travel over 407 mph on land. Titanic Historical Society: In Massachusetts there’s a museum that is dedicated to shedding new light on the ill-fated voyage of the world’s most famous ocean liner. Inside this official Titanic museum there is a single faded piece of paper. Do you know why this wireless telegram was unable to save the Titanic from her tragic fate? Big Foot Discovery Museum: Nestled in the heart of Northern California’s epic red wood forests is a museum dedicated to the region’s most famous alleged inhabitant, Big Foot. Can a recently discovered primate tooth put an end to the age old debate of whether or not big foot is real? 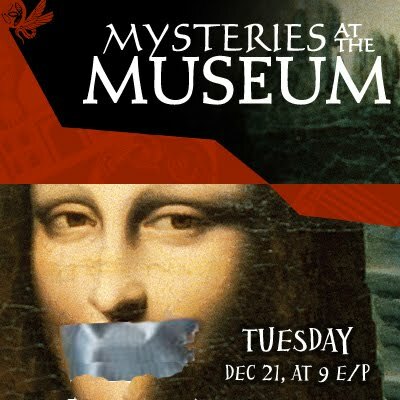 Find out the answers to these questions and more by tuning-in to Mysteries at the Museum Tuesday at 9 E/P on Travel Channel. Enjoy the show, and secrets that will be revealed. 826 National is a nonprofit tutoring, writing, and publishing organization with locations in eight cities across the country. Our goal is to assist students ages six to eighteen with their writing skills, and to help teachers get their classes excited about writing. Our work is based on the understanding that great leaps in learning can happen with one-on-one attention, and that strong writing skills are fundamental to future success. There are eight local chapters of 826, including Boston. While we think the goal of 826 is one of the noblest pursuits, we have a special love for Boston. The executive director of 826 Boston, poet and longtime writing teacher Daniel Johnson oversees not only volunteer-staffed writing programs, but also the Greater Boston Bigfoot Research Institute. Below is a short excerpt from an article published at The Boston Globe's online site boston.com. Its great to see a successful non-profit organization encourage the young ones to read and write creatively, and to use the Big Guy as inspiration is all the better. In 2007, Boston opened its own chapter of 826 National, the nonprofit cofounded by Dave Eggers to foster writing among students, ages 6 to 18. As executive director of 826 Boston, poet and longtime writing teacher Daniel Johnson oversees not only volunteer-staffed writing programs, but also the Greater Boston Bigfoot Research Institute, housed in the center’s Roxbury storefront. His first book of poems, “How to Catch a Falling Knife,” was released in April. 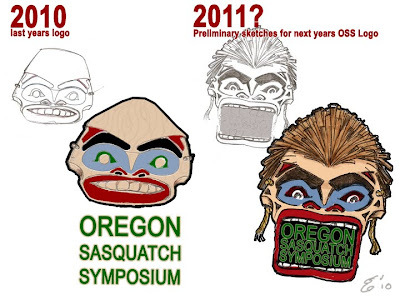 Given your work at the Bigfoot Institute, what are your preferred books on Bigfoot, Sasquatch, or yetis? That’s a good question, and it relates to my early love of reading. My brother, who was eight years older than I am, had a book on Bigfoot, with a black and white cover and a pair of glowing red eyes in the woods. I remember looking at the pictures of the Patterson-Gimlin footage, and fixating on that book, but not being able to read it. We carry one of the definitive Bigfoot texts: “Sasquatch: Legend Meets Science” by Jeff Meldrum. And we have a book that our kids absolutely love called “Cryptozoology A to Z” by Loren Coleman and Jerome Clark. Our students have to walk through the Bigfoot Institute to the tutoring center, and so pretty regularly, Bigfoot or the chupacabra appear in their writing, like a deus ex machina. You know, there’s a wedding, and there’s a problem, and then suddenly Bigfoot appears. Like a Bigfoot ex machina. We can only imagine what the Wile E. Coyote blue print looked like when this gentleman came up with this plan. While we applaud his efforts and enthusiasm, we don't recommend trespassing. A man from Lancaster spent Monday night in a nature preserve 75 miles east of Dallas trying to lure Bigfoot to his black Toyota sedan, police say. Mineola Police Capt. Jack Newman tells Unfair Park he responded to a trespassing call Tuesday morning to find the man camped out in his car along the Sabine River, with bait on the roof of the car he said was meant to draw the reclusive forest giant out of hiding. "He had some pieces of orange and a piece of steak and some nuts right on the top of his car," Newman says. Next to a tree about 20 yards away, he says, the man had scattered a few more orange pieces. "I don't know if he'd been trying to coax him over to the car or what." "He'd heard something about Bigfoot down around the Sabine River," Newman says, though as far as he knows, the biggest wildlife draws around the preserve are deer and wild hogs. Fanning the flames of mystery, Newman says he can't release the name of the man, who he says left the scene when asked. "He didn't know he wasn't supposed to be in there," Newman says. A report from KMOO radio in Mineola, though, says there have been fresh rumors of a Bigfoot sighting on private property near the preserve. One possible explanation: the Texas Bigfoot Research Conservancy held its annual conference in nearby Tyler in late October, though as Noah Bailey pointed out after hearing me on the phone this afternoon, Mineola has been a hotbed of Sasquatch activity for years. Buster Green, a Mineola Nature Preserve caretaker who works for the city, says he spotted the man Tuesday morning and spoke to the would-be hunter briefly before calling police. "He was rolled up there sleeping in his vehicle when I come by," he says. Green says the man had a camera in his car; KMOO reports he was otherwise unarmed. "He said he'd come down here on kind of a whim," Green says. "He was a big boy. He's over six-foot, 230-ish," Green says. "He didn't need nothing to be hunting Bigfoot. He could've gone down there with just a switch." At a 9th anniversary 9/11 rally, a proud sign-holder advocating for the reality of Bigfoot is accused of trying to send an anti-semitic political message. Here is the reprinted commentary from the American Power blog. Douglas apparently didn't notice that the sign actually had three words, all spelled correctly, rather than two words with one of them spelled incorrectly: Sasquatch Is Real. It didn't have anything at all to do with Israel. Thom Powell, author of the successful book, "The Locals," has already begun his social media presence with a quite a lot to say. 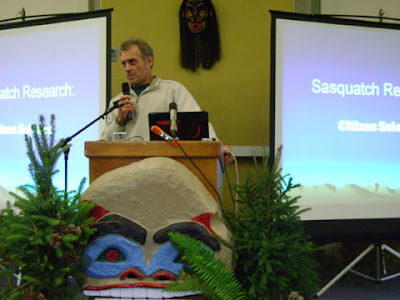 His second blog post at ThomSquatch.com Titled, "Bigfoot Research: Intel not Science" goes a long way in shifting paradigms. Below is a very short excerpt. Said another way, we should regard them as guerrillas, not gorillas. They're like the Taliban in Afghanistan, the Viet Cong in Viet Nam, or the French Resistance during World War II. They hide from you as you look for them. They have their sentinels, their disguises, their ruses, and their hideouts. Whenever you get too close, they 'roll up the sidewalks' and retreat to those hideouts where you will not find them. Bigfoot researchers, then, are like the CIA and the spooks at CIA are not utterly focused on unassailable proof when they evaluate the information they gather. I suspect they take spurious and incomplete data sources because sometimes that's all they can get, and they use them to look for recurring observations that suggest suspected patterns of behavior that might have predictive value. Everything they gather is a bit uncertain but this does not justify throwing that data away. It is understood that the quarry is smart enough to cover their tracks. Indirect and uncertain sources of information are still valued and exploited. You can count on Thom having a lot more to say. You can visit his weekly posts at thomsquatch.com. Yes yes, coming right up! We wouldn't be true to ourselves, if we didn't provide some primatology sources once in a while. We love primatology and believe if you are interested in Sasquatch you should also be interested in primatology. Why is primatology so important? Besides learning what a midtarsal break is? Primatology also includes other disciplines such as biology, anthropology, morphology and even understanding the social mind of primates. So the list below is a unique list. 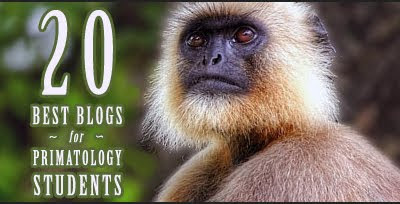 It is a top 20 blogs for primatology students, provided by toponlinecolleges.com. How do we know its a good list? Because right at the top is our very favorite, Primatology.net. If you don't check out every blog on the list, we believe Primatology.net is essential. Primatology.net: This stripped-down WordPress blog is low on frills but high on great content, including the latest news on animal discoveries and primate study centers. (This post about a study comparing ape behavior in the exhibit and holding areas of a zoo is a great example.) Definitely a source to bookmark. Afarensis: Anthropology, Evolution, and Science: Taking the title and mock persona of a hominid that lived millions of years ago, Afarensis offers bite-sized but invaluable blurbs and links to major primatology news as well as other sharp bloggers in the field. Tons of archives and a deep blogroll make it a worthy read. Primate Freedom: Fantastically detailed posts offering context and history for primate news, especially relating to cruel lab tests. One of the smarest ways to stay informed. DNApes: DNApes, given their title, isn't one to shy away from mixing humor with primatology. (The picture on their Facebook page speaks volumes.) They post a variety of news articles and video links, with the occasional joke or fake story thrown in for good measure. Lighthearted but never dumb. MonkeyWatch: MonkeyWatch is basically like having an RSS feed for primate news. The posts usually don't have a lot of additional writing beyond a summary and link out, but the news being reported is still perfect for primatology students. Basic but very helpful. The Prancing Papio: Raymond Ho started this blog when he was an undergraduate getting a bachelor's degree in anthropology. Now a graduate and devoted primatologist, he continues to write with informed and strong opinions about animal news and research. Savage Minds: Savage Minds is great for students because it's a collective blog authored by Ph.D. candidates and professors with the goal of exploring anthropology (including primatology) and making it a lot easier to digest for broad audiences. Their news and opinion pieces are mixed with lighter fare like best of the web round-ups. Your Inner Bonobo: Bonobo Handshake author Vanessa Woods runs this blog as part of the Psychology Today brand, and she focuses on chimp news from around the world. Bone Girl: Kristina Killgrove ranges far and wide in her blog — as a physical anthropologist, she's into the Fox series Bones — but she also touches on primate issues with skill and intelligence. Barbara J. King: Barbara King, the Chancellor Professor of Anthropology at the College of William & Mary, has studied apes across Africa and the United States and holds multiple degrees in anthropology. Basically, she knows what she's saying, and if you know what's good, you'll read. Beast Ape and the Bleeding Heart Baboons: Run by an anonymous doctoral student in the midwest, this blog is devoted to behavioral biology and all that entails, including primatology and psychology. A Primate of Modern Aspect: Another anonymously run blog by a graduate student from the Great Lakes region (there must be hell to pay for mouthing off against fellow academics online), this site offers incisive breakdowns of current primate research as well as entertaining observations on the life of a grad student. John Hawks Weblog: Paleoanthropology, Genetics, and Evolution: Anthropologist John Hawks teaches at the University of Wisconsin, Madison, and blogs about everything from early man to monkey behavior. A wide-ranging but always entertaining blog from one of the most committed bloggers in the field. Spider Monkey Tales: Although not updated quite as frequently as some others, Spider Monkey Tales makes up for that by offering great insights and images from monkey research in the field. A great way for students to get a grasp on what the life is like. This Is Serious Monkey Business: Blogging from a university anthropology department, this writer is a self-proclaimed "budding primatologist" whose posts focus on monkey life, culture, and research. Always loads of solid info. The Monkey Matters Blog: Blogger Kenny Chiou is a researcher and field biologist with a passion for primate evolution. His blog and the archives provide a fascinating firsthand look at what it's like to study primates in their natural habitats and learn from their lives. Neighbor Ape: Jill Pruetz writes from Senegal, on the western coast of Africa, with the goal of raising awareness about chimpanzees there and raising money to save them. It also covers charity work aimed at locals. Beyond Bones: Run by the Houston Museum of Natural Science, this insightful blog covers history and culture from an anthropological perspective. Nature Alert: The giant banner says it all: "Dedicated to helping save orangutans and their forest homes." Some of the news reports about abused or slaughtered animals are heartbreaking, but that dedication to exposing and ending cruelty is precisely what makes this blog such a necessary read. Great Apes Blog: Hosted by National Geographic, this blog offers news and insights from field conservationists working throughout Asia and Africa to preserve great apes. A fantastic global perspective on the plight of primates. More Bigfoot news from China's Global Times. Now, the article doesn't go far enough explaining who the famous science writer is. They tell us his name, Fang Zhouzi, but not much more. First off, his opinion is significant, he has a huge international reputation and is well respected in academic circles for exposing the scientific and academic fraud of China's higher education system. He has a Ph.D in Biochemistry. And he doubts Bigfoot. Why would he feel the need to try and rain on our parade? We have no idea. It could be due to the latest press attention of the Shennongjia Nature Reserve in Hubei, a known Sasquatch hotspot. It could be the latest $1.5 million endeavor to discover Sasquatch by Hubei Wild Man Research Association. He might be trying to promote another book. Who knows? While we may not know his motives, we can read his arguments in the reprinted article below. Global Times (China) -- Well-known Chinese science writer Fang Zhouzi, who developed a reputation for exposing academic fraud, insisted that Wildman (Bigfoot) is a figment of people's imagination even as an organization in Hubei Province prepares to hunt for the mysterious half-human, half-ape creature. In an article titled "Wild Man in Shennongjia? How Come There Is Not a Tooth Left?" published on the Beijing-based China Youth Daily Wednesday, Fang said the chance of Bigfoot's existence is next to zero and certain evidence associated with his existence are not "convincing." 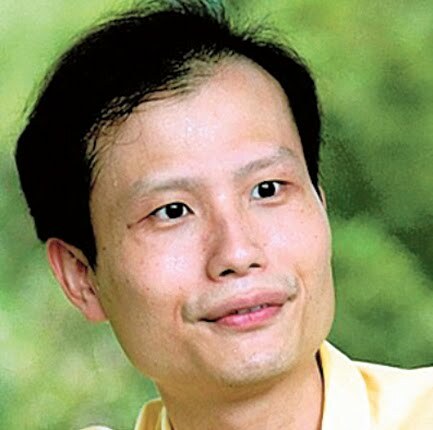 Fang's assertions came two months after the Hubei Wild Man Research Association said that they would launch a 10-million-yuan ($1.5 million) campaign to search for the creature, although the project was postponed "indefinitely" due to a lack of financial support, Wang Shancai, head of the association, told the Global Times. The Shennongjia Nature Reserve in Hubei has long been rumored to be home of the elusive Bigfoot. Wang said some hairs found there were more advanced than apes' hair and they were tested by the Chinese Academy of Sciences. It was reported that more than 400 people said they saw Bigfoot in the Shennongjia area in the last 100 years including villagers, reporters and explorers, the Xinhua News Agency reported. However, Fang insisted that those evidence are scanty. Fang argued that no fossils of Bigfoot have been discovered. "There is not a single tooth left, how do you expect people to believe it?" Fang said. He said that by examining DNA extracted from the remaining cells in the root of hair, it is possible to determine the species of the hair. However, Fang said that since all the hairs discovered so far do not have roots, it is impossible to make such a conclusion. "It's absolutely not necessary to conduct such scientific research in the first place, which is a waste of time and money," Fang told the Global Times. He said the expedition was a ploy to attract tourists. In response to the accusation that Fang is not an expert, he said he studied biology and has a say on this matter. 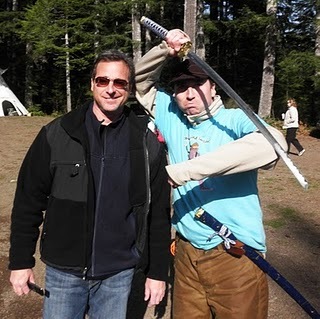 Many of you may have seen the new Bob Saget show called Strange Days, in particular, you may have seen the episode where he went squatchin' with Bigfoot hunters. The episode was aptly titled "Let's go Squatching." One of the largest break-out personalities was Bigfoot phenom Craig Flipy. And yes, we mean phenom. This young prodigal man has somehow reinvented what sasquatching is all about, incorporating ninjitsu and bushcrafting. We are not joking and neither is he. See the audition tape below. Theres more than one reason to watch for Craig Flipy, as entertaining as he is, he represents the newest generation of squatchers; un-jaded adventurers who's journey towards finding Sasquatch is just as important as the destination. M.K. Davis contacted us last week and was concerned we were perpetuating rumors. That's the last thing we want to do. We made a correction to an earlier post and apologized for over generalizing a sensitive subject. For those who don't know, M.K. Davis is famous for stabilizing the Patterson/Gimlin featuring the Sasquatch affectionately known as Patty. Regardless of any rumors, there is no doubt M.K.Davis has made a great contribution to the Bigfoot community. We pride ourselves on being responsible and respectful to all members of the Bigfoot community. We believe, all of us, truly want to discover, if not understand, Bigfoot. Pollyanna-ish? Naive? We don't think so, we just like people. We would like to take the opportunity to reintroduce M.K.Davis to fans of this humble web site. We exchanged several emails with Mr.Davis and recently talked to him on the phone. After all these exchanges, it became very apparent M.K. was passionate about analyzing the Patterson/Gimlin Film (PGF). It was all about the film. The film itself had new information with every new viewing, like a mine you could continue to prospect if you were careful and patient enough. We didn't find a man who saw some anomalies and built a whole story around them, we found a man who saw anomalies and openly pondered what could have caused them. We heard several possibilities for each odd shape, motion, or color. We would like to share some of the of the things M.K. Shared with us. First Let's get one thing straight, M.K. 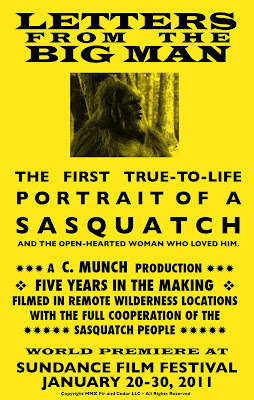 is absolutely convinced that, Patty, the Sasquatch in the film is absolutely authentic. He emphasized this over and over, this film is the best evidence for Sasquatch and should have been enough to convince the skeptics. Heres some amazing isolated back muscle movement as well as some great glut definition. Finally some stills of the backside, these are particularly interesting, because they almost show a baldness on the "cheeks"
We would like to thank M.K.Davis for sharing his research. Okay fans, this is truly breaking news. A new Sasquatch movie is set to premier at the Sundance Film Festival 2011. 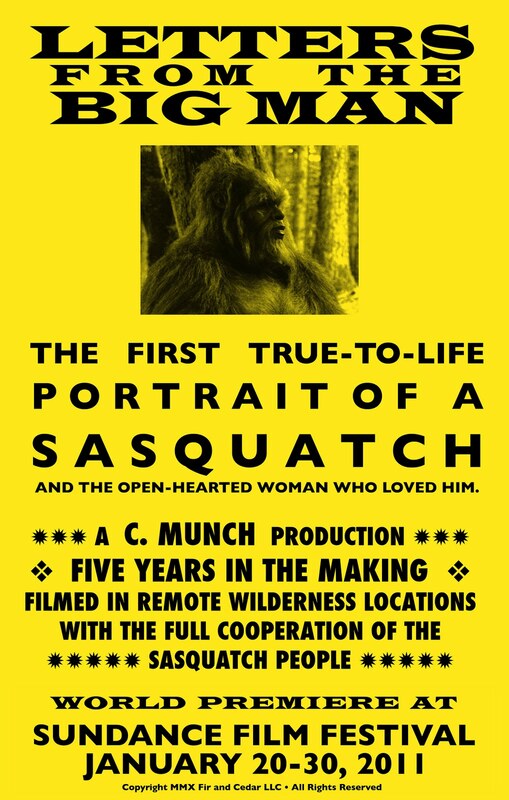 Titled, Letters from The Big Man, this movie promises to be the first true-to-life portrait of Sasquatch. Currently we have only received a promotional poster, but we have been in contact with the director and plan to follow up with a trailer as we get closer to the world premier on January 20th. We can't express how excited we are to see this movie. It has the potential to redefine how popular culture thinks of Bigfoot. Below, are synopsis of the movie from around the web. Sarah Smith, an artist and government hydrologist, sets out on a post-fire stream survey in a remote part of the Kalmiopsis Wilderness of southwestern Oregon. In the course of her journey through this ancient and ecologically diverse land, she unwittingly finds herself interacting with a sasquatch man, and a mutual curiosity ensues. As their friendship deepens, Sarah must take bold steps to protect his privacy, as well as her own. “Letters From the Big Man” • Writer-director Christopher Munch (“The Sleepy Time Gal,” Sundance 2001) returns with this story of an artist and hydrologist (Lily Rabe) who must protect a Sasquatch man (Isaac C. Singleton Jr .) she meets in Southern Oregon. "Letters From the Big Man" - Directed and written by Christopher Munch. 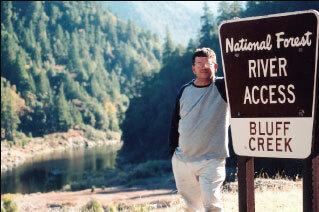 About an artist and government hydrologist surveying a remote part of southwestern Oregon. With Lily Rabe, Jason Butler Harner, Isaac C. Singleton Jr., Jim Cody Williams, Fiona Dourif. World premiere. 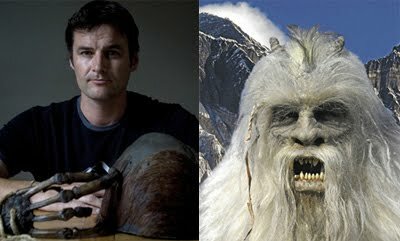 New Zealand (Sunday News) — A KIWI adventurer is leading an international Yeti hunt. Mike Allsop, who conquered Mt Everest three years ago, is searching for the skull and skeletal hand of what was said to be a mythical "Abominable Snowman". The controversial artefacts were stolen from a monastery in the tiny Nepalese village of Pangboche, in the 1990s. "I am hoping that the person who has them wants to give them back," Allsop told Sunday News. "I hope they will have an alert set up on their computer for whenever the artefacts are mentioned on the internet. "I am offering... to go and reclaim them. I will go anywhere in the world in person, free of charge, no questions asked and I will also buy them a beer." Weta Workshops has created life-sized replicas of the skull and hand to help searchers find the real things. Allsop, 41, is an Air New Zealand pilot and was introduced to Weta boss Sir Richard Taylor by Air NZ chief executive Rob Fyfe. Allsop will hand-deliver the replicas to the monastery when he and 17 Air NZ co-workers travel to Pangboche in April. The original Pangboche hand and skull came to international prominence in the 1950s. Texan adventurer and oil magnate Tom Slick photographed the items during one of his early missions to find the Yeti in 1957. Two years later, one of Slick's team returned to the Pangboche monastery. He reportedly drank Scotch with a monk until the local passed out, before stealing bone fragments from the hand. He then supposedly replaced the bones with those from a human hand, before rewrapping the Pangboche hand to disguise his theft. The stolen fragments were allegedly smuggled back to America by a Hollywood star. Then in 1999, the skull and what remained of the skeletal hand were stolen from the monastery. Allsop, who scaled Mt Everest in 2007, was intrigued when he learned of the artefacts and determined to reclaim them for the monastery. "These were very treasured artefacts," he said. "There was a huge outrage when they were stolen. "The monks initially wouldn't show them to anyone, then slowly they showed them... unfortunately they showed them to one person too many." Check out the Nepalese Yeti on the AKA Bigfoot World Map (below). Click on the icon to read about the Nepalese Yeti. On October 29th, 2010 Discovery Magazine interviewed, Christopher Bader, co-author of Paranormal America Ghost Encounters, UFO Sightings, Bigfoot Hunts, and Other Curiosities in Religion and Culture in a Halloween themed article. "Bigfoot hunters were perhaps the most surprising group, Bader said. They defied all stereotypes of paranormal pursuers who wear flowing clothes and commune with spirits." A significant number of Americans spend their weekends at UFO conventions hearing whispers of government cover-ups, at New Age gatherings learning the keys to enlightenment, or ambling around historical downtowns learning about resident ghosts in tourist-targeted “ghost walks”. They have been fed a steady diet of fictional shows with paranormal themes such as The X-Files, Supernatural, and Medium, shows that may seek to simply entertain, but also serve to disseminate paranormal beliefs. The public hunger for the paranormal seems insatiable. 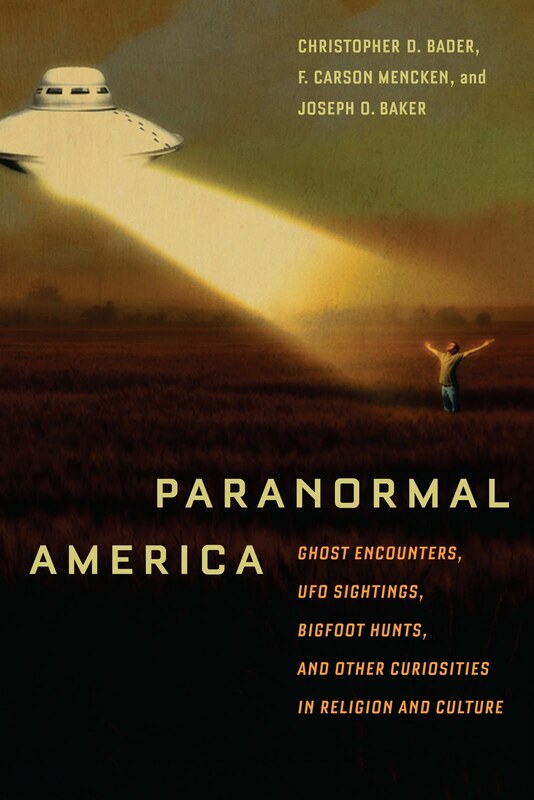 Paranormal America provides the definitive portrait of Americans who believe in or have experienced such phenomena as ghosts, Bigfoot, UFOs, psychic phenomena, astrology, and the power of mediums. However, unlike many books on the paranormal, this volume does not focus on proving or disproving the paranormal, but rather on understanding the people who believe and how those beliefs shape their lives. Drawing on the Baylor Religion Survey—a multi-year national random sample of American religious values, practices, and behaviors—as well as extensive fieldwork including joining hunts for Bigfoot and spending the night in a haunted house, authors Christopher Bader, F. Carson Mencken, and Joseph Baker shed light on what the various types of paranormal experiences, beliefs, and activities claimed by Americans are; whether holding an unconventional belief, such as believing in Bigfoot, means that one is unconventional in other attitudes and behaviors; who has such experiences and beliefs and how they differ from other Americans; and if we can expect major religions to emerge from the paranormal. Brimming with engaging personal stories and provocative findings, Paranormal America is an entertaining yet authoritative look at a growing segment of American religious culture. Legendary producers Sid and Marty Krofft brought their unique puppetry to Saturday morning television in the late sixties, creating one iconic series after another. They became a beloved institution in the process, capturing the hearts and minds of children and adults alike with their whimsical worlds of wonder. For a while, Rhino was releasing entire series DVD box sets for all of their titles, including H.R. Pufnstuf, Sigmund and the Sea Monsters, Land of the Lost, Lidsville, and The Bugaloos. But these sets have since gone out of print, and are no longer available. Well, don’t fret! As Vivendi Entertainment has secured the Krofft catalogue, and are re-mastering each episode under the supervision of the Krofft brothers themselves for future releases. On January 18th, H.R. Pufnstuf: The Complete Series DVD returns like you’ve never seen it before, packed with all new special features and great new artwork. Leading up to this fantastical, magical release, Vivendi has also unleashed an amazing compilation disc titled Sid and Marty Krofft’s Greatest Saturday Morning Hits, which is available in stores now. The great thing about this particular DVD is that it offers remastered, never-before-available episodes of Electra Woman and Dyna Girl and Bigfoot and Wildboy. We recently caught up with Marty Krofft to chat with him about the future of Krofft, including all of the home video releases that are planned for the near future, as well as the big screen adaptations he is planning for such iconic characters as the dragon mayor H.R. Pufnstuff and the beach dwelling Sigmund and the Sea Monsters. Why did you decide to re-release H.R. Pufnstuf first, when you still have so many wonderful titles that haven’t been given the full series DVD treatment? Is it because of the re-mastering of the video? Marty Krofft: Yes, the picture looks great, but that wasn’t the reason. Look. The first time we had it out, there was no promotion. We sold a bunch. We sold about sixty thousand sets. But I think we’re going to find a whole new audience now. We’ve done some extras that are different than before. But don’t ask me what they are right now. I can’t think. Did you get Jack Wild back in to do some commentaries, or some behind-the-scenes documentaries? Marty Krofft: Jack? I guess you don’t know. He died of mouth cancer. It was not pretty. He couldn’t talk. He lost his voice halfway through the surgery. We have extras with people from the show. Billy Hayes is still around. Witchiepoo. She is in good shape. I know we’re going to do really good with the way we are doing this particular set. But other people have asked us that. We’re making the H.R. Pufnstuff movie at Sony. So we are taking these titles, and we are making movies out of them. We have a deal at Universal set up for Sigmund and the Sea Monsters. And we’re about to have another one set up with another big studio, to do our first animated movie. Lidsville. It’s not set up, so I can’t talk about it. But that will be a good one. Right now, it looks like all of our titles are going to come back as movies. We have The Bugaloos, we are developing that. It will be a whole new group of Bugaloos. We are putting together incredible music for that, for the kids. It will be country. No one has done that yet, so we are putting that together. It will be for Tweens. That will fit in with Miley Cyrus and the J.O.N.A.S! age group. This Krofft compilation disc that came out finally brings Bigfoot and Wildboy to DVD. It’s a little disappointing that we don’t have a full series set yet, but as a fan, we’re super excited to see it on here. How did you decide which episodes of Bigfoot and Wildboy to put on this thing? Marty Krofft: We picked the ones that were never out. The episodes that have never made it onto DVD. We picked those. We just wanted to have this simple one come out. It’s not expensive. We wanted to reintroduce it all to the audience. It’s going into Wal-mart. We have a big order from there, and they are the key place in the country. All of the shows will eventually be out. We are working on Electra Woman and Dyna Girl. We are going to turn that into a feature. We already have a script. We’re dealing with Bigfoot and Wildboy. So there might be a Bigfoot and Wildboy movie? Get out of town! Marty Krofft: Oh, totally! Bigfoot and Wildboy will be a movie. It’s a great idea. We’re also looking at Dr. Shrinker. Marty Krofft: We had a big script meeting yesterday. We’re already on our second draft. We have Dennis McNicholas writing. We contracted a guy who has never done a live action movie to direct. He has done a couple of small cartoons. Monsters Vs. Aliens and Shrek 2. Conrad Vernon is his name. So we got a good guy there. We are doing the origin story that we’ve never done. It’s a little heavier. Its got the same tone as the series. We’re not screwing with it. Because there were so many reruns of H.R. Pufnstuff. More than any of our other stuff. You can’t mess with it too much. You’ll really piss off the audience who grew up with it. Like you! So we’re going to see the origins of Pufnstuf. Are you still going to have Jimmy come onto the island? Marty Krofft: Jimmy will arrive on the island. And Pufnstuf? We are going to show how he got to be mayor. We’re not messing with it. We’re not messing with the characters. I think it’s going to have the humor that we need. It’s also going to have the heart that we want. Are you going to be able to get the original voice of H.R. Pufnstuf? Marty Krofft: Lennie Weinrib died, also. So no. We are going to have to find a new Pufnstuf. Marty Krofft: I know. We weren’t able to nail it in the movie that we made in 1970. We didn’t have Lennie Weinrib to do it then, so we had to get someone else. And we never got it nailed. It always bothered me. But it didn’t bother the kids, or anyone else. We have to be careful with all of the repeats. The movie, though? I think we are going to do a good job on this movie. I am really excited about the H.R. Pufnstuff movie. Marty Krofft: You are the only fan that wasn’t pissed off. Its funny. The movie? We were dead by the time Land of the Lost opened. The critics who grew up with the show were pissed off, and they buried us before we even opened. And we were unlucky, we had The Hangover on top of us. We had to change our date, because Harry Potter and the Half-Blood Prince came out in July. We moved to June. Then The Hangover was opposite us. Who knew that was going to be so big? Marty Krofft: I wish you were the whole audience. Anyone who watches it on television loves it. Its similar to what happened with H.R. Pufnstuf. That hit in 1969, yet the repeats kept it on the air, and later audiences are the ones that really gravitated towards it. Marty Krofft: It’s a big cult thing. We’ve given kids this new H.R. Pufnstuf: The Complete Series DVD, and they flip out. It drives their parents crazy. The funny thing is, we only had seventeen episodes. We repeated them so much, people thought we had a hundred. What we are going to do is release some of the DVDs that we have never released, and release some of the ones we have with all-new extras. And we are going to treat them all very special. Every few years, the audience changes for the kids. They grow up. Some of them miss it. The last H.R. Pufnstuf set didn’t come out until 2004. And it has been missing since then. So there is a six-year span. Again, like I said, the promotion and the awareness the first time around was very low. Though, we still sold a bunch. When you guys were with Rhino, it was my belief that Far Out Space Nuts was next in line to get a full series DVD set. Are you going to put that out soon, or are fans who already own the other full sets going to have to wait through re-releases of Sigmund and The Bugaloos to get to the ones they are missing? Marty Krofft: Look, you are going to see everything soon. With Universal/Vivendi, they want it all out. We’re the distributors in this deal, so we are the ones doing all of the work. We will get everything out. What is the release window going to be like for each new box set? Marty Krofft: Right now, other than H.R. Pufnstuf coming in April, we don’t have a schedule yet. We’re going to try and have releases every three to four months at the most. What about Pryor’s Place? As a huge fan of both Richard Pryor and The Kroffts, can you tell me when this DVD set is going to eventually come out? Marty Krofft: We don’t own that show. We sold that back to Richard Pryor‘s wife. But, Richard Pryor? He was a genius. He was sober when he did our show. He was definitely unusual to deal with. And he changed his mind one hundred times about whether he wanted to do it our not. Once he decided that he wanted to do it? He was a pro. Then he didn’t want to do it again. I could write a book about my relationship with him. I had a close relationship with him. I talked to him every night. Not about the show. Have you ever seen him live? Marty Krofft: I was at lunch with the President of Paramount. And I said, “Why don’t you buy a show from us?” He said, “Who can you get?” I said, “What if I get Richard Pryor?” He said, “If you get Richard Pryor, you can have it.” I didn’t know Richard Pryor. But I knew his lawyer, who had worked for us at the beginning of his career. Actually, I was in New York, at the Meridian Hotel in the middle of winter. I had Jim Henson come up to my room. We were having a meeting. He said, “What are you doing next?” I said, Richard Pryor!” He went out the door. I went, “Why did I tell him that? I don’t have Richard Pryor.” That gave me the determination to make sure I went out, and I did get him. Ultimately, I was able to do it. Why don’t you write that book? That sounds like a fascinating book? Marty Krofft: Well, first I have to sit down and write our book, before I write that one. (Laughs) Maybe I’ll make it a chapter. You didn’t have anything to do with the book that came out before? The Pufnstuf and Other Stuff book? Marty Krofft: No. We had some input. The guy that wrote it was a fan. He did most of it. He talked to everybody. He did a good job. I think one of the most fascinating aspects of that book is the chapter on your legal troubles with McDonalds. Are you able to talk about that this far removed from the incident? Marty Krofft: I can talk about it now. According to the book, McDonalds was no longer able to use Mayor McCheese or Sheriff Big Mac because of their close resemblance to Pufnstuf. Yet, in resent years, we’ve started to see both characters pop up in both the McDonaldland cartoon that was produced a couple of years ago, and in the merchandising. When was it decided that these characters could come out of retirement? Marty Krofft: We settled with them because they were the elephant, and we were the flea. When we settled with them, which was not for a ton of money, they had a right to use those characters. But only after we settled. At the time, we needed the money, because we were independent. So we made that deal with them. I don’t think they retired the characters after the settlement. I don’t remember what they did. I think they kept them going for a while. They basically stole Witchiepoo and Pufnstuf. Mayor McCheese was Pufnstuf, and The Hamburglar was Witchiepoo. They originally came to us to do this whole thing. It was one letter written by the ad agency that buried them. It said, “We want you to do McDonadland ala H.R. Pufnstuf.” And they had access to our place. They probably hated us at the time. Marty Krofft: Yes. And they hired up most of our people. Its weird, because McDonaldland is so iconic to those of us who grew up as kids in the 70s. It has stuck with me just as much as Pufnstuf. Yet it’s all based on lies. When I tell other people who grew up in the 70s that McDonaldland was stolen from you guys, there is a general air of disbelief. Marty Krofft: Sure. I know. It’s the leading copy write case in the world. We’ve done a lot of things in our career. And that was one of them. It took thirteen years to make that settlement happen. We had to go to the appellate court to overturn the federal judge. When you bring Pufnstuf to the big screen, are you going to bring in any knowing wink to that whole fiasco? Marty Krofft: I don’t think so. We are just doing this movie head-on. It’s a movie that is going to have heart. Hopefully, it will make an impact. It will be live-action, but we will have some of the CGI. We are in 2010. We should have it. We learned a lot doing Land of the Lost. We are going to try and keep the integrity of it. We will have some low tech and some high tech. Can you tell me more about what is going on with Sigmund and the Sea Monsters? Marty Krofft: That is being developed over at Universal. That is a little slower in development. We have Dana Gould, who is writing it. We are working on that at the same time. Have you started talking about casting? Marty Krofft: We are always talking about casting. But we aren’t ready yet. I start mentioning names, and then I may not get them. It worked in getting Richard Pryor. Marty Krofft: I didn’t mention that name to anybody except the guy at CBS.Well, and Jim Henson. Marty Krofft: You’re right. I forgot. Back then, there wasn’t the internet. But there was Jim Henson. And I am sure he went out and spread this rumor that you had Richard Pryor. As far as Jimmy goes, are you at all considering Russell Brand? I mean, will we see a grown Jimmy living on the island? Marty Krofft: No! This is not going to be like Land of the Lost. Hiring Will Ferrell and Danny McBride, that made it almost like a spoof. This is going to be an actual H.R. Pufnstuf fantasy. We will have a kid living on the island. Marty Krofft: Oh, of course! We have talked about him. The other day I said, “By the time we make this movie, he will be thirty-seven.” We don’t know when this is going to be greenlit. But it will be sooner than later. Now, I want to go back to Bigfoot and Wildboy. It is my favorite show that you’ve ever done. How did you come up with the look for Bigfoot? A lot of Bigfoot enthusiasts think that you guys nailed it. And there is a rumor out there that you guys have actually seen Bigfoot. Marty Krofft: Right. What we do is have our artists create what we want to do. Different people do different things. We pick the one that is most credible. We always pick great talent. Young talent. We’re working in these areas. We have always had great artists working in house. Like, with the Sleestaks. They come up with their own versions of this stuff. And Bigfoot was the same thing. What about the myths and rumors? That you guys had encounters with Big Foot? Marty Krofft: Well…I think that since we never did drugs, that never happened. Right? That does play a big part in the myth. People always claim that you must have created this stuff high on something. But it’s impossible to have this much creative output when you’re doing drugs. Marty Krofft: I tell everybody, look…If we did as many drugs as they claim we did, we’d be dead today. Nobody can be creative, and go to work everyday, and be either drunk or loaded. That’s not going to happen. Maybe the kids watching were, but not us making it. This is not what this was all about. Even though they all thought so. I guess that was a good myth. Everyone else is still asking about it. Beyond the drugs, at the time Bigfoot and Wildboy came out, In Search Of with Leonard Nemoy was another very fascinating show for kids. Were you guys playing off the popularity of that show in creating your own? Marty Krofft: I don’t remember that show. No. I don’t think so. I don’t think we watched other shows. We weren’t inspired by other things. 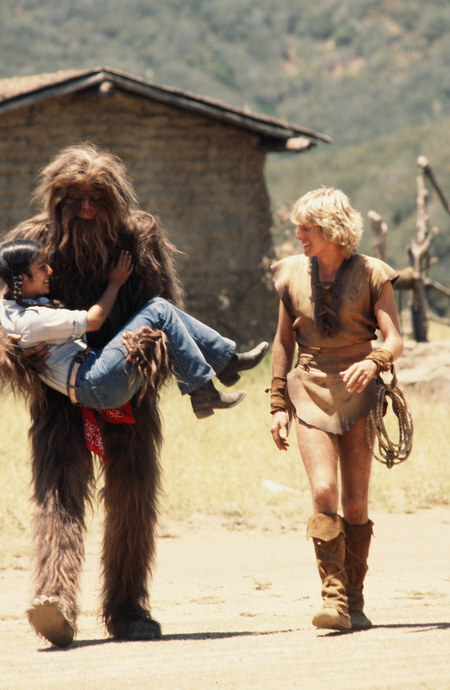 But, like you said, I think Bigfoot and Wildboy could make a great movie. I’ll be first in line for that one. Marty Krofft: One thing that excites me about you is that you are the biggest fan. It makes me feel good! H.R. Pufnstuf: The Complete Series DVD will be available on January 18th. Sid and Marty Krofft’s Greatest Saturday Morning Hits is in stores now.